On the 24th we broke camp and took up the march for Vicksburg. Various rumors were afloat as to what would be done next with us. Much news had reached us of military work in distant parts, the most significant of which was the Confederate invasion of Pennsylvania and their repulse at Gettysburg. Depressed by the stifling heat and wearied by a period of wakefulness and imperfect rest, we still felt that buoyancy of spirit that pervades a victorious army after a remarkable success of arms. Some of the boys thought the rebels ought to give up now, since they had been so unsuccessful all summer. Little idea did we entertain that the closing battle was almost two years distant, and regiments now grouping around Vicksburg were to carry their silken flags through the hot breath of battle, over fields ghastly with heaps of slaughtered fellow creatures. Yet so it was. 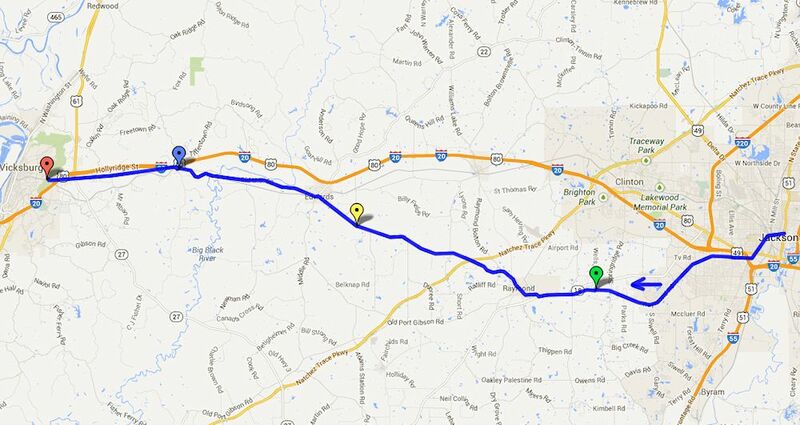 The red paths from Wilderness to Appomattox, and from Chattanooga to the sea must yet be trodden. Period military map showing the approximate route of the 16th Ohio from their campsite at Camp Alice, near Bovina Station, to their campground of July 24, 1863, on the old siege line, two miles east of Vicksburg. 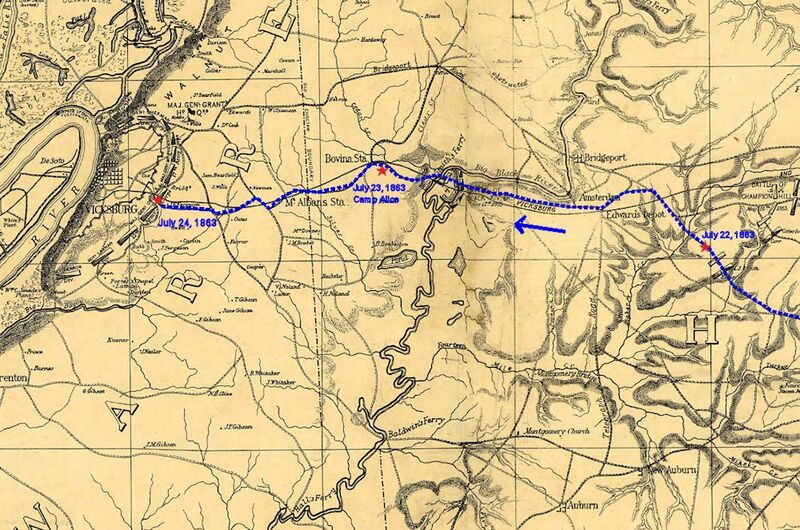 Modern day map showing the approximate route of the 16th Ohio from their campsite at Camp Alice, near Bovina Station, to their campground of July 24, 1863, on the old siege line, two miles east of Vicksburg. Yellow pin - Approximate location of the campsite of the 16th Ohio on the night of July 22, 1863. Blue pin - Approximate location of Camp Alice, the campsite of the 16th Ohio on the night of July 23, 1863.